I have only spent one year of my entire life, almost half a century, living in a place where it snows in the winter. Because of this, picture books about snow days have the same sense of magic and non-reality for me as a trip to Narnia might. The upside is that, as an adult, I can read a picture book about snow and feel the wondrousness of waking up to find snow on the ground and feel the cozy security of being inside with a cup of hot cocoa without being reminded of the work of shoveling out and the ugliness of dirty, slushy snow. 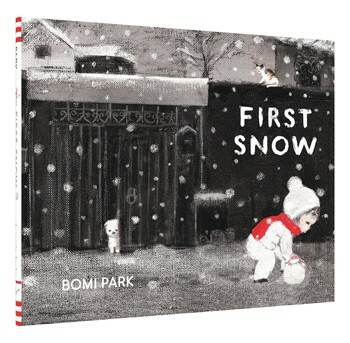 First Snow by Bomi Park, a South Korean Renaissance woman (she studied piano, architecture and psychology) is yet another wonderful picture book about snow that transports me to a magical place. With minimal text and palette, Park's debut picture book, calls to mind the graphic novel The Only Child by Chinese author and illustrator Guojing. In the dark of the night, a little girl wakes to snow falling. She suits up and heads out into the back yard, where a puppy emerges from the dog house where mother and sibling sleep, curled together. "Roll, roll, roll," we watch as the girl, dog trotting behind, rolls a snowball through her neighborhood, under the street lamps. Through the woods, creatures looking on, she continues, "Slow. slow. slow." Park's sparse text captures what I imagine it feels like to be in a newly snow covered world early in the morning. The girl and her snowball arrive in a snowy filled filled with other children pushing snowballs and building snow people. A glorious two-page spread shows the children, seemingly floating in the air, dancing with their snow creations. A page turn shows the little girl in the corner of the recto, tongue sticking, waiting for a snowflake. The words on the verso read, "First snow." The final two pages show her backyard, a snowman in a red scarf, the puppy pawing at it. Although I've only experienced a first snow once in my life, I imagine that Bomi Park's First Snow captures perfectly what it feels like to be a child waking to a new, enchanting landscape.